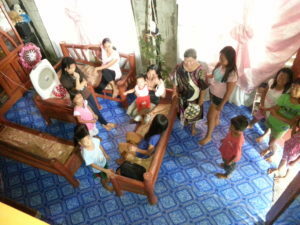 For the new readers, Inday is the lady that takes care of the children’s home for us. She does it without pay and only benefits in being able to live there with her daughter. I mentioned about a week ago that Inday was very sick with what I understand to be some type of congestion, infection in her chest and infected tonsils that were draining. I heard from her on Thursday that she was beginning to feel better. She still has 14 days to go on the antibiotics so I am hoping that she can get completely recovered. The other volunteers have been helping with the children while she has been so sick. It is truly a blessing to have those so willing to help when she cannot help. These volunteers take turns helping when they can and do not have regular schedules, but they are a tremendous help. Thank you for your thoughts and prayers. I ask that you will continue to pray for a full recovery for her.